IASSIST is running a blog post series on Qualitative Social Science Data. Part 2 has some great links for librarians and faculty working with qualitative data. The posts are open to anyone and they are welcoming comments, especially for additional resources. Check it out! Having some fun with ArcGIS Online today using the IASSIST membership. It is definitely a Canada-Europe-US organization, but we are getting more members around the world. Just need to work on Central/South America! 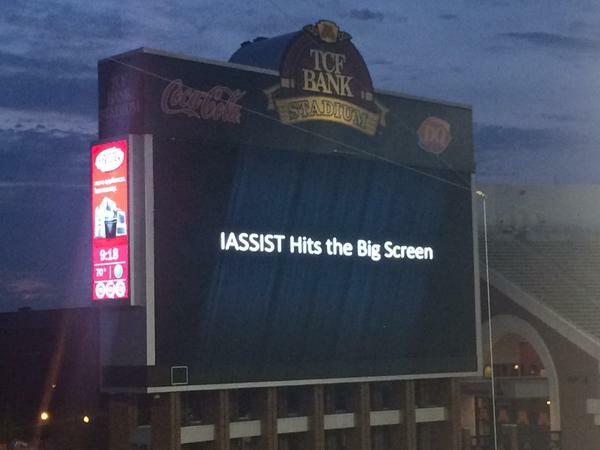 I attended the IASSIST annual conference last week in Minneapolis, Minnesota. IASSIST is an international data professional conference and a great forum for data specialists to get together and chat. I am very happy to say it went well because I was the Program Co-Chair and if it hadn’t gone well, well … These are my brief notes from the sessions I was able to attend and take notes (a few times I was unable to stay in a session because of questions elsewhere). I would suggest looking at the twitter feed if you are interested. We had a new member taking sketch notes during the conference, which were quite popular. Also Laurence Horton from LSE took very detailed Google Doc notes. Day 1 kicked off with a fantastic plenary by Steve Ruggles from the conference host, Minnesota Population Center (MPC). His talk focused on the development of the Census over time. His main argument was that the Census Bureau (CB) played a tremendous role in developing innovative technology and data collection methods during the early years through the mid-twentieth century, but that the more recent Census years have seen stagnation and a loss in the CB’s leadership. While depressing at points, Ruggles highlighted a few collaborations between the CB and the MPC that are promising such as the Census Longitudinal Infrastructure Project (CLIP). I chaired a session entitled Training Data Users. King-Hele discussed training efforts at the UK Data Archive. Primarily they have concentrated on in-person workshops, but they have also started creating webinars and training guides/videos. I’m looking forward to checking some of these out during my summer! Katharin Peter at the Univ of Southern California talked about supporting data-related assignments. Her univ had a competitive grant program for faculty to encourage the creation of these assignments in conjunction with instructional designers and Katharin as the data librarian. Although USC was able to offer significant grant amounts, I think faculty could be encouraged with much lower amounts at other schools. Another incentive could be the creation of communities of practice where faculty can share and learn. They will eventually create a repository of data assignments but that is in the early stages. Finally Kristin Eschenfelder and her team from Univ of Wisconsin (Go Badgers!) closed out our session. They used the IASSIST journal, IQ, to analyze connections between Social Science Data Archives over time. Using historical network analysis they were able to track the interactions between the different archives and funding agencies. It is a really interesting project and I can’t wait to see where they go with more data. They were also part of our new paper track and were required to submit a paper in advance, which anyone can access. They also won the first paper award prize. The plenary for day 2 was a bit controversial, but we meant it that way. We had Curtiss Cobb, head of the Population and Survey Sciences Team at Facebook, talk about Facebook’s interest in the digital divide in the developing world and its initiative Internet.org. They have also been acquiring third party data to inform their research, so Curtiss discussed his evaluative framework for acquiring data. Again, Laurence has more notes on the specifics of the talk. While there were questions about Facebook’s “altruistic” intentions, I enjoyed having an outside perspective on social science data and its use. I also attended a fabulous session with the Minnesota Population Center on their various data programs. So much goodness in this one. They talked about their products from the old standbys like IPUMS-USA and IPUMS-International to newer products like Terra Populus, which integrates environmental and population data. The one I am really excited about for my history graduate work and haven’t used much is the North Atlantic Population Project. With our Atlantic World focus at UNCG, it seems that this could be popular. The last session I could attend was Training Data Users II. David Fearon and Jennifer Darragh from Johns Hopkins talked about training for de-identifying human subjects in data sets. This is a really cool and extremely specialized service, but one that I am sure lots of faculty would welcome with the new sharing requirements. They developed their workshop information from a training session offered by ICPSR. They have some handouts, but I couldn’t get the URL down in time. I will add when it is available.